We met Jestina at the South Sound Wedding and Event Show at the Great Wolf Lodge earlier in the year. When Jared and Jestina told us about their engagement shoot ideas we could not wait to work with these two! How can you not adore this couple’s free spirit, sense of humor and show of love? For their shoot we went to Riverbend Ranch in Tenino, WA. Next year this will be the venue for this couple’s wedding. It was great to get a sneak peek at this amazing venue – and it help set the stage for what they had planned. As your wedding photographer Firstlight Photography will work with you to pick just the right location for your engagement shoot. Many of our couples like to go to their venue for the shoot. As the photographer it is a great opportunity to getting the lay of the land and we can talk with couples about specific locations for the day of the wedding photos. As an engaged couple you get to see how your venue photographs. If you have something else in mind we are your sounding board and work with you to cultivate your ideas. Other locations that our couples like include downtown urban areas, an open field (we have our own vintage picnic basket and other fun elements), a graffiti wall, a meaningful to you place – you get the point…we’ll go just about anywhere! We will work with you to plan out your vision. Start looking around on Pinterest. Create an inspiration board and share it with us. check out our engagement ideas board while you are there! Your engagement photos capture a very special time in your romance. With a little planning we can help you suss out a vision and a plan of action. As part of your wedding package, we will work with you to develop these into announcements / save the dates for your big day. We love Offbeat Bride and the clients it brings our way. When we did our pre-shoot phone consult, Alyson had a major game plan. There was no lack of ideas so we were pretty excited to get the show on the road. We sensed the couple was going to be fantastic to photograph. We met Andy and Alyson at their Seattle/Georgetown engagement shoot. Since they are getting hitched at the Central Cinema in Seattle, we started there and then whisked off to the Georgetown Ballroom. Both are amazing venues. We feel so lucky to get to work with the couple’s that choose us. We have really focused on our niche and we aren’t turning back. And, yes, that is a hint for an upcoming blog about defining your clients. Just another reason we LOVE what we do. Alex and Nichole are getting married soon and we are lucky enough to get to shoot their wedding in Port Townsend, WA. We met them at the West Sound Wedding Show in Bremerton earlier this year. 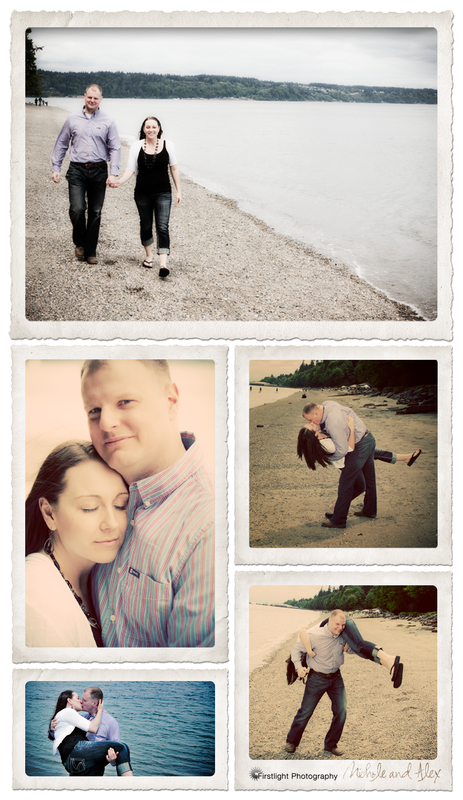 Here are a few more engagement pics on the beach. Yay! We did it! Kier and I were so happy that our very first wedding show turned out to be a success. We had never done a booth before so we showed up with our McGyver filled suitcase and were ready for any curve ball. Kier’s mom, Monika, was a life saver. She helped us get the booth organized and our wall installations situated. We even had an hour to spare so we enjoyed a nice breakfast and conversation. We met so many amazing couples and vendors at the South Sound Magazine Wedding and Event Show. Paula and her crew were on the ball. I saw Paula the week before at a networking meeting – she was working it for all of the vendors! We were able to meet some fabulous vendors that we will continue to network with. We’re booking up for summer thanks to help from our first show. We called Paula and asked her to book us for her September show in Tacoma. It is a two day event so we hope Monika will come back to help! Planning a wedding is filled with so many decisions. Spending the time to find the right photographer for your event is key because of the importance of documenting every detail. Lets face it, your photographer only gets one chance at so many key moments. The day is filled with excitement and emotion – it goes by in a flash for couples. Our job is to make sure we catch all of the little things that you might not have time to see. We also deliver the posed and group photos and we have a fantastic time capturing candids of our couples and their wonderful and very amusing guests. How do you know what photographer is right for you? We recommend that you take some time and research websites for local photographers. Make some calls and spend some time getting to know your professionals. We sit down and meet with prospective couples over coffee and take time to learn about your wedding and your photography needs. Reviewing our portfolios is very helpful because it not only gives you a sense of our work, but we begin to understand your personality and what types of photos you like. We work with many local wedding professionals and can also help to answer other wedding questions. To arrange a meeting time call us at 253.335.7958 or send an Email (kier@firstlight-photography.com)!